Known as Chaharshanbe Suri, the ancient festivities are among major Persian heritage dating back to thousands of years deep into the history. Most of these festivities have been forgotten over years but a few of them are still alive and observed in Iran. 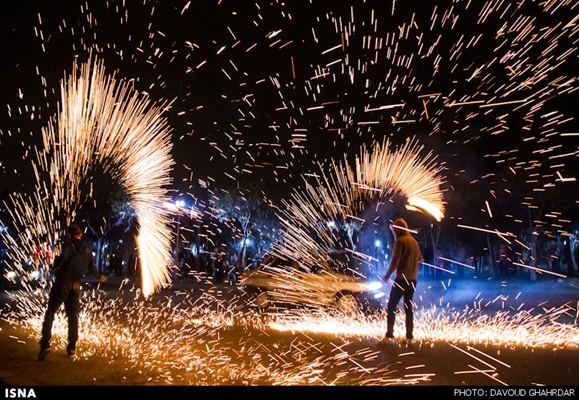 In the northwestern province of Zanjan, people usually mark each Wednesday of the last Persian month, Esfand, by holding special ceremonies. On the first Wednesday, they scatter some seeds of wheat, corn, lentil and mung in their yards, before their houses or wherever exposed to running water maintaining that the rain or running water will take the seeds away to the heart of nature. This, they believe, will provide them with their food for the next Persian year. During the second Wednesday, they cut short the wool of their livestock and keep them at the barn. Then they begin to mark the day with dancing and holding other festivities. On the third Wednesday, they go to their garden and hang some light stones from the branches of their trees using pieces of rope to remind the trees of the need to give fruits as soon as possible. Then they begin to dance in the garden. Sometimes, they gather around a fire and hold some special festivities. During the last Wednesday of the last Persian month, they put on their new clothes and get on the roof of their houses. Then they make a fire and receive warmth, energy, and cleanness from it. They return to their homes again and continue the festivity inside. They gather together and eat special dishes like the popular Sabzi Polo (herbed rice) with Fish. After the dinner, the families begin to read out the poems of legendary Iranian poet Hafez. It is widely believed by Iranians that Hafez’s poetry will reveal the answer to their destiny.